Letting it ride is gambling jargon that refers to when a player leaves their money on the table and keeps betting it on the same thing. Your bet doesn’t move from hand to hand; it becomes a revolving door. We hear something like this often at the craps table. Sometimes letting the winnings ride works, and we never forget those 45-minute rolls. These kind of memories are what make trips to the casino fun. Unfortunately, heaters and hot streaks only come along so often, and any attempts to score big are wiped away. The casino almost always has an advantage on the player. This advantage is often referred to as the house edge, and the casino always wins over time. When you let your winning ride and parlay your money you’ll have a chance of creating an amazing memory and getting the kind of big win we discussed. Unfortunately, this win is only going to last for a short time. 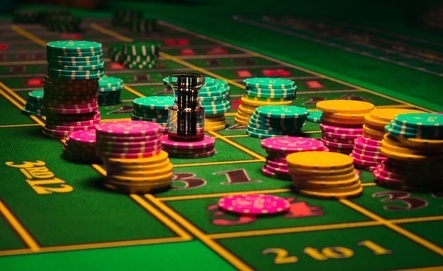 The math behind casino games is usually against you and it always benefits the casino over time. You might look double down on your pass line bet hoping that the hot roll continues. The shooter will hit that third point around 3.3% of the time. To put it another way, the odds against the shooter hitting a third point are around 97%. Just after you’ve doubled up your bet to take advantage of the hot roll, the shooter rolls a seven and craps out. There go the dream and potential for a great memory at the craps table. Gambling math comes from thousands of games played (or simulations). You’re going to hit a hot streak every now and again but over time, the odds will always revert to the math. There are rolls in craps that you’ll remember for the rest of your life, but they’re few and very far between. It’s fun to let it ride in the casino but the math never supports doing this. Let’s head to the blackjack table where the casino has among the smallest advantages over the player of any game in the casino. Basic rules will give the casino less than a 1% house edge in blackjack. Blackjack is a fun game but to have that small house edge you must learn and play using basic blackjack strategy and play with consistent betting patterns. The probability that you’ll win one hand of blackjack is 42.22% according to Wizard of Odds. If you let your winning hand ride on the next few hands, the probability of winning four hands in a row is only 4.62%. While you may make some money for a couple of hands, over time you’ll lose it just by letting it ride. If you’ve learned to count cards in blackjack you know that your looking to bet more when you have the advantage with the cards and less when you have less of an advantage. Card counting can change the advantage in blackjack to the player. Betting correctly helps make the game profitable. Bet spreads for card counters are specific. The goal of counting cards is to make money and not letting bets ride just because it’s fun. The math behind casinos games is set up that letting winnings ride is not a part of a winning strategy. You can let it ride in the casino but over time, that’s not going to be profitable. The math behind casino games makes sure of that. In the end, winning is fun.